At Fix Apple Now, we have tried to make it as easy as possible for our customers to have their Apple devices, Android devices and PCs repaired by our highly experienced technicians. 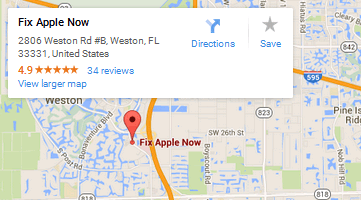 Below you can find driving directions from Google Maps to help you get from Sunrise to your nearest Fix Apple Now store, situated in Weston. You can either copy the driving instructions below or click here for a larger map and driving directions. Alternatively, if you do not have the time or don't want to drive to your local Fix Apple Now store, we operate a mail in repair service where you can post your faulty tech items to us to fix for you. Once repaired, we can mail them back to you. Fix Apple Now is for you if you need to mend, repair, replace or restore your Apple device in Sunrise. We can fix your iPhone 4, 5 or 6, iPad, iPod, Apple Mac, Mac Mini or MacBook for less, so why head anywhere else if you've been looking for the right people to get the job done? Our engineers have been repairing Apple devices for years and have experience in dealing with all sorts of problems including boot loop, crashing apps, cracked screens, frozen screens, iPhone 6 handsets not charging, enlarged icons and home buttons not working, to give just a few examples. We always try to fix and get your device back to you as soon as possible so you don't have to spend more time apart from it then necessary. You can get in touch with us at any time to find out more about how we can mend your iPhone in Sunrise. Why not talk to us today to learn more?